If you watched the Academy Awards last night, I don't need to tell you that the Lego versions of the Oscar statuettes that dancers handed out during their performance of "Everything Is Awesome" from The Lego Movie were one of the highlights of the night. Especially in an evening with a lot of deeper, more controversial moments like Patricia Arquette's comments on feminism, and the Academy leaving Joan Rivers out of the In Memoriam section, it was nice to have a light moment thrown in there that was purely enjoyable. Particularly because The Lego Movie itself was snubbed for a nomination, I'm all the more impressed with their determination to get in there and make an impact. 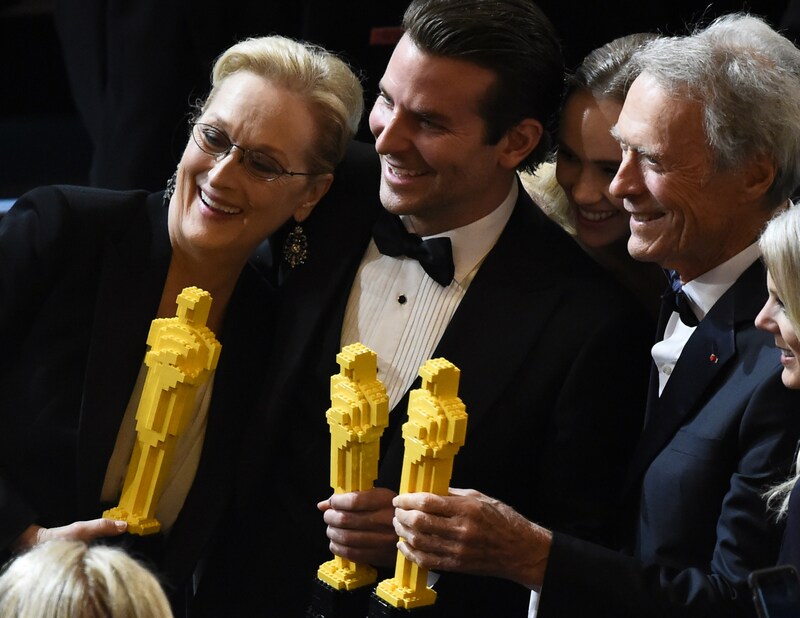 Throughout the evening, many big stars ended up with their own Lego Oscars, including Meryl Streep, Oprah Winfrey, Bradley Cooper, Clint Eastwood, and Emma Stone. And since we all spend most of our waking hours trying to be those people — no?? just me?? — I figured you might want to know how to make said Lego statuettes at home! Even if you aren't a traditionally crafty person, just follow these simple steps, and I promise you'll end up with a real masterpiece. You're hardly ever at Target, so please don't let this be another one of those times when you forget to get toiletries and have to make a whole 'nother trip, Alexis. Because you forgot to get two containers, and unless you get two containers, you won't have enough yellows. And if you could pick me up some dry shampoo while you're there, that would be choice. Go into your office if you have to. This is important. You really only needed the print-out to follow as a model for your Lego Oscar, but now's as good a time as any to hash out whom you wanna thank in your eventual acceptance speech. Finally. Don't know where the day went, it's getting dark already. Hmmm... this is harder than it looks. Maybe get a glue gun? Did you know there's an America's Next Top Model marathon on? That like... almost never happens. You don't want to miss this, so put all the Legos away in their boxes, except for the ones you can't find. This part is easy; all you have to do is forget all about them, then get out of bed with bare feet in the middle of the night, and THERE THEY ARE!